Whew! It’s a hot day on the desert! 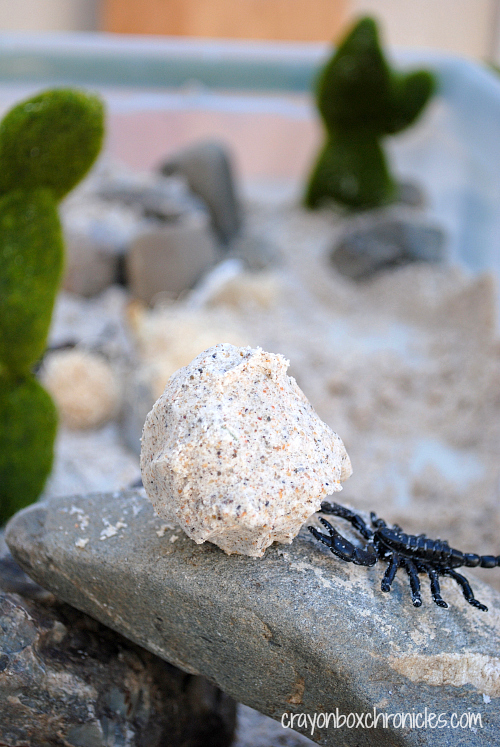 Our desert small world includes animals, plant-life, tumbleweeds, and moldable sand cloud dough! 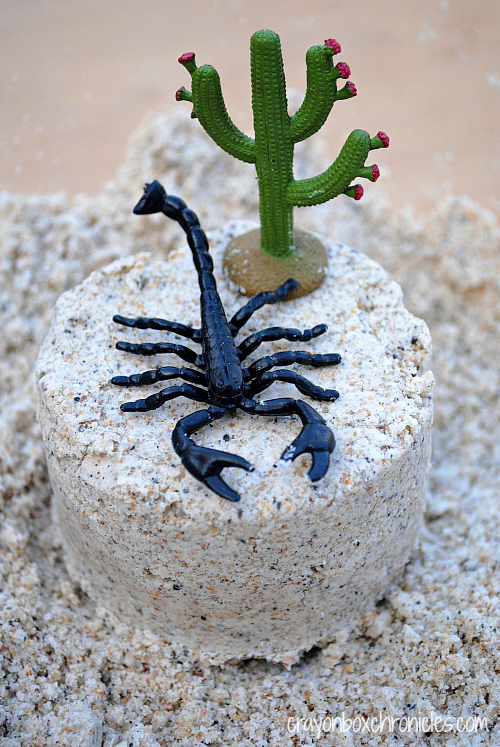 We’ve made sand dough in the past, but this is different. It smells like snow dough, but has a gritty texture. It’s soft and flaky and uses just 3 ingredients. After experimenting with cloud dough, I decided to mixed the two recipes together! 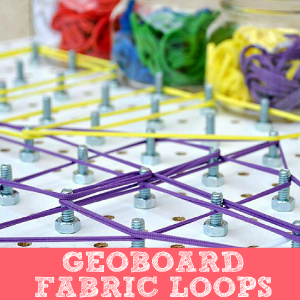 It’s a great sensory material for kids. Let’s make it and build our landscape before we explore the desert! What is the worlds hottest desert? The Sahara, ‘Great Desert,’ is the world’s hottest desert, and the third largest desert after Antarctica and Arctic, which are cold deserts. We made 3 batches (6 cups flour, 6 cups sand, and 2-1/4 cups baby oil). No play sand on hand? Substitute sea salt to achieve the grainy texture. Pour flour into a large bowl and add baby oil. Mix well; it will form into small clumps. 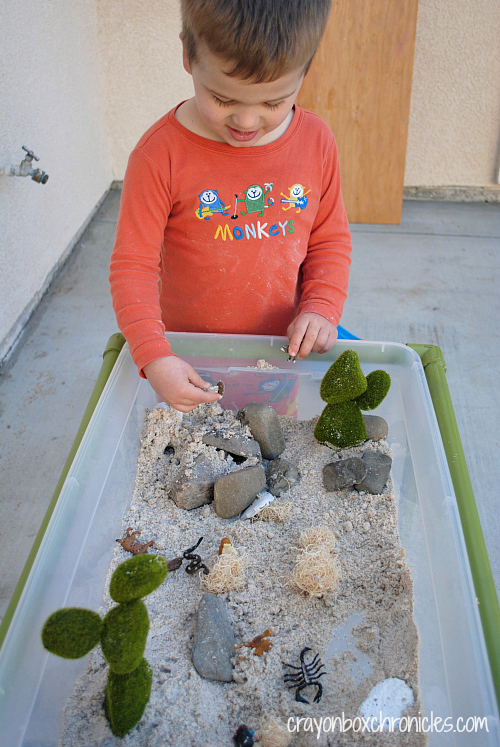 Add play sand and continue to mix with hands or spoon. 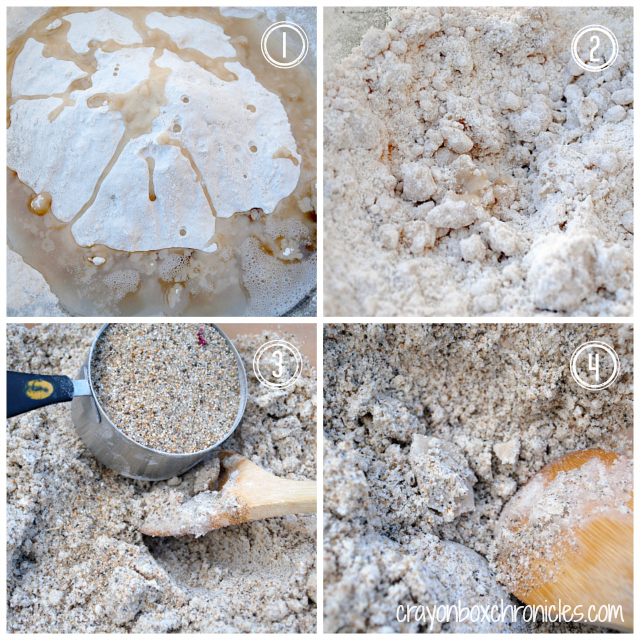 Using a large spoon, mash down any remaining clumps until it has a smooth, gritty texture. The spoon option isn’t necessary, I just wanted the sand to be more desert-like before he started. C loved the mixing part! The aromatic punch is a sensory delight! The contrast between the soft and gritty really makes molding it so fun! 3 ingredients, easy, reusable and moldable — can’t beat it! 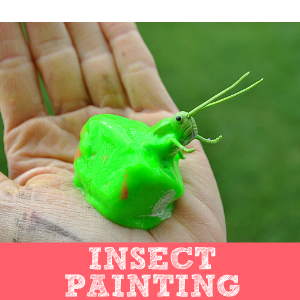 To reuse it, just seal in an airtight containers or zip-lock after playing! 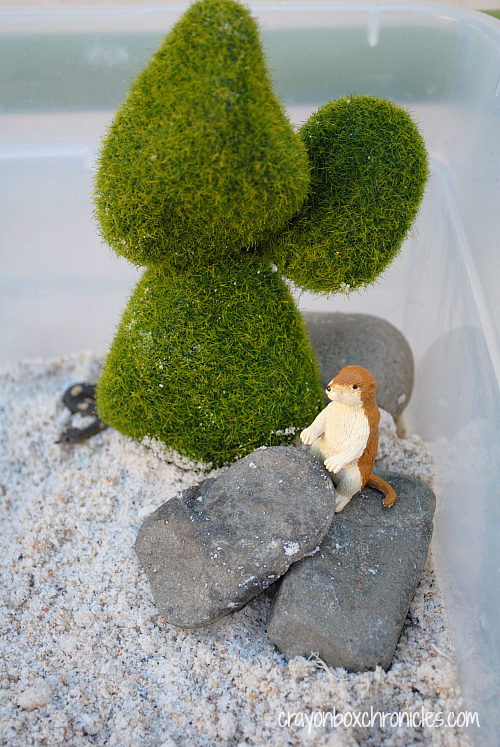 Let’s build our small world landscape! Here’s our pre-animal landscape! All building materials are from the Dollar Tree. The rocks came from our rock garden in our backyard. This small world is simple to set-up and uses just a few materials. Total cost was just $2 for the moss shapes. The ‘tumbleweeds’ or hay-like filler [not pictured here] is also a Dollar store steal! Other than that it’s just toothpicks, 2 small pieces of vase foam to hold the cactus, and our rocks! As an added touch, I raked the sand cloud dough to resemble wind-swept sand. 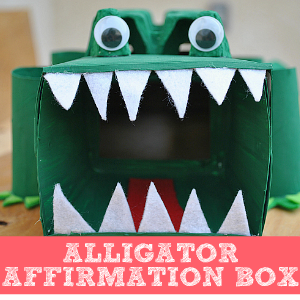 Simple, fun and full of imaginative play! 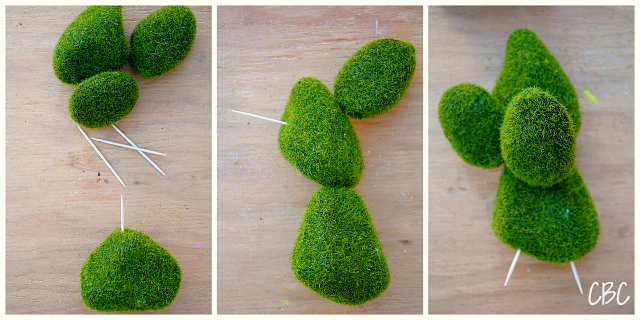 The moss ball shapes come in a 4-pack, so you can make one big one or two smaller ones. We purchased two of them from the Dollar Tree. Michaels has moss balls as well. 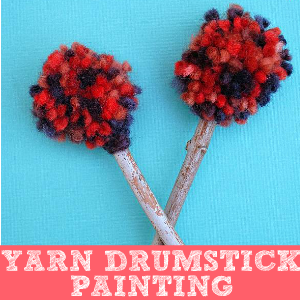 A few other alternatives to the moss shapes are sponges or green hand dusters from the Dollar Tree. Simply remove the handle from the duster, bend the fabric in half, and rubber band at the bottom. To construct the cactus, simply follow the diagram. 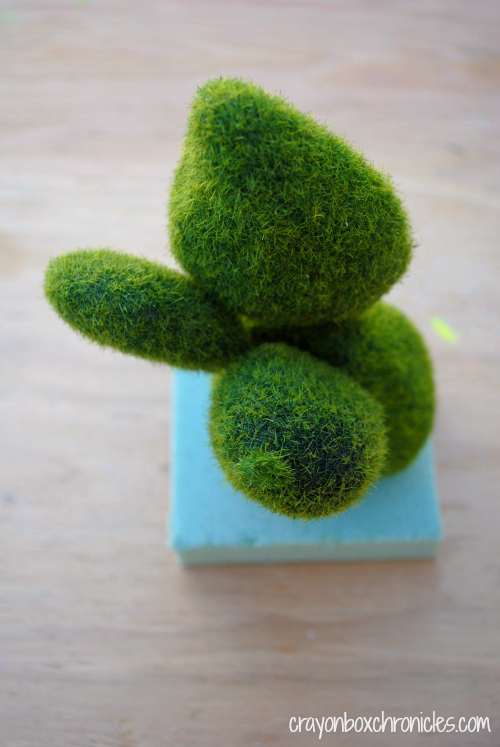 Add a moss shape, then repeat until finished. Add two toothpicks on the bottom to attach the cactus to your foam base. 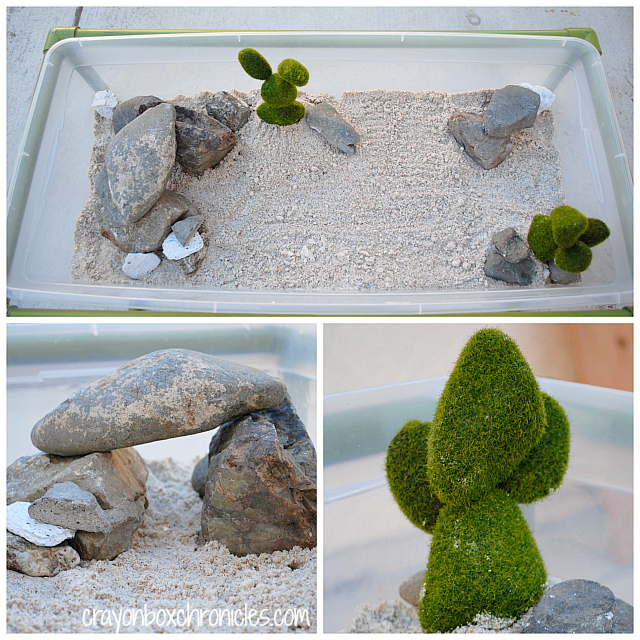 Using floral foam or styrofoam, cut a small square larger than your cactus. Attach the cactus to the floral foam base. Now that we’re all set-up, let’s explore the desert together! 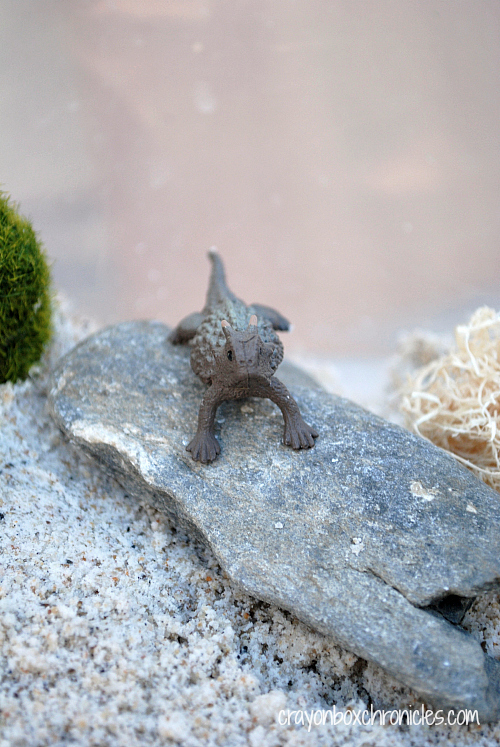 Safari Toobs animals include an explorer, horned lizard, saguaro cactus, road runner, scorpion, snake, coyote, big horn ram, bobcat, armadillo, mountain lion and prairie dog. It’s HOT! 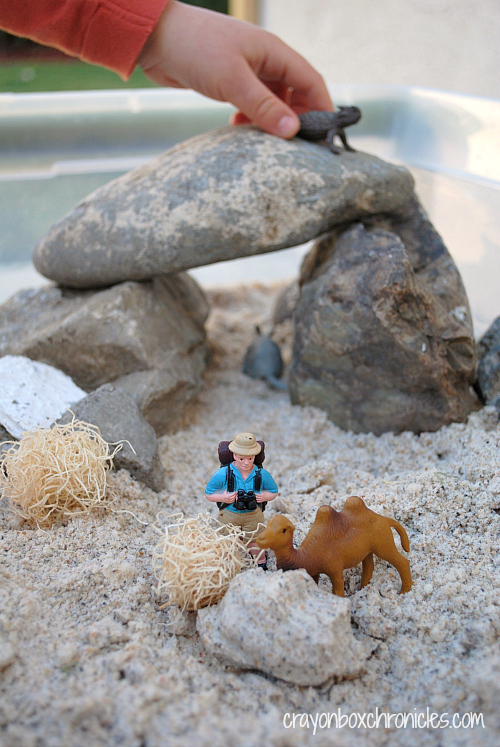 Mr. Explorer is brave roaming the sandy desert alone! Conditions are so harsh in the desert. Camels have thick coats that protect them from hot days and cold nights. Food and water can be scarce, but they can go for over two weeks without eating or drinking. C had a blast molding the sand cloud dough! Even scorpion played along! Watch out for rolling tumbleweeds! 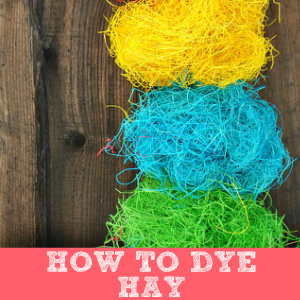 It’s ‘hay-like’ vase filler, also a Dollar store find! 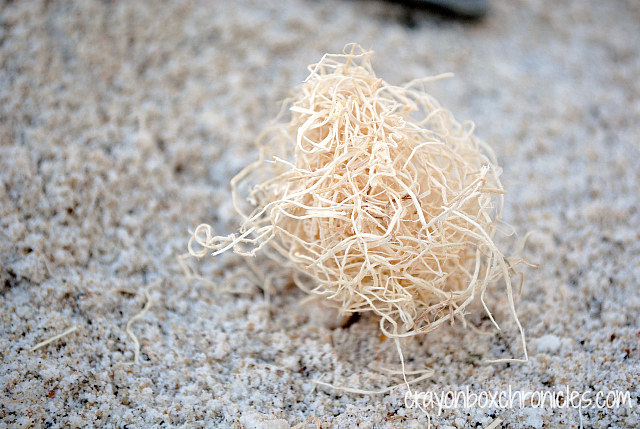 The Tumbleweed is a plant that breaks away from its roots and moves around by the wind. These plants can be as small as a soccer ball or as big as a car. They grow and spread very quickly because the hot, flat desert terrain makes it easy for them to travel. Stone Plateaus, or hamada is a type of desert landscape consisting of high, largely barren, hard, rocky plateaus, with very little sand because this has been removed by deflation. 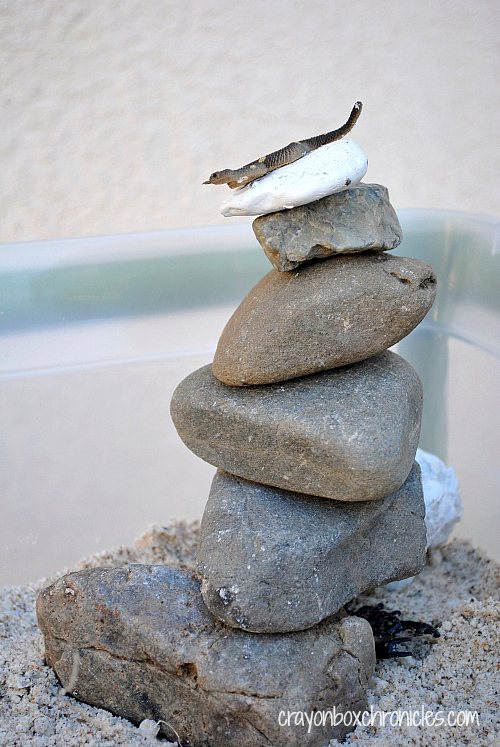 Ever try rock balancing? Try it, its super fun! The thorny devil lizard was C’s go-to animal! The Thorny Devil is a type of lizard that is approximately the size of a human hand. It’s covered with cone-shaped spines and has a spiny hump behind its head. They use this hump to protect themselves from predators by putting their head between their front legs and exposing the hump. 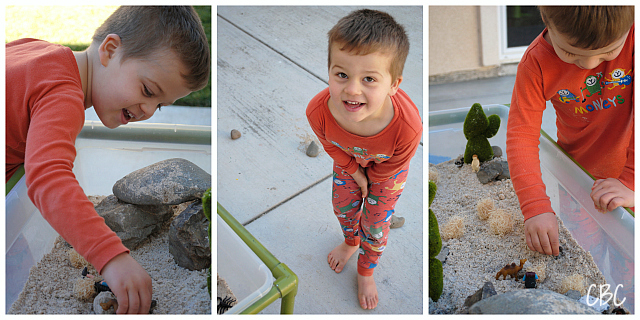 Rocks are so fun to play with, especially when you make caves and tunnels! 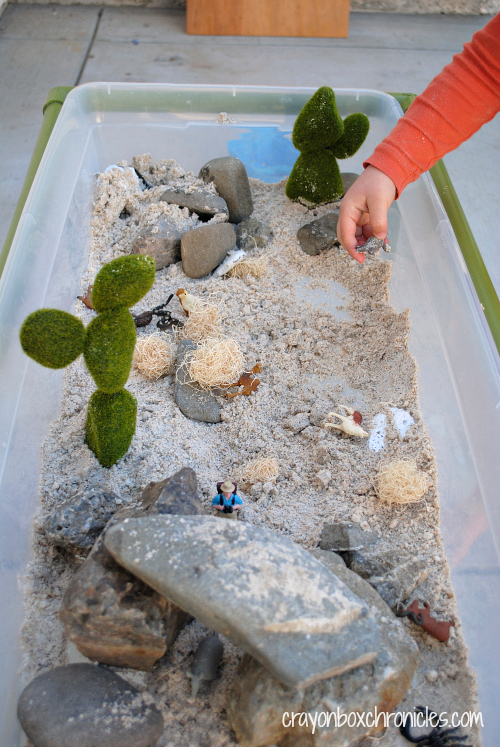 We’re focusing on simple, easy to set-up small world play! Ouch cactus! Prickly pear cactus are present in North American deserts. All have flat, fleshy pads that look like large leaves. The pads are actually modified branches or stems that serve several functions — water storage, photosynthesis and flower production. Snake! C loved the rock tunnels! Molding, stacking, and crushing the sand cloud dough was fun! C kept saying, “Bop-boop, SMASH!” Apparently spiky lizard was the smasher. C had a blast! He kept giggling and signing. I’d say it was a fun, educational, and sensory stimulating kind of day! Thank you for exploring with us! Looking for more small world play? 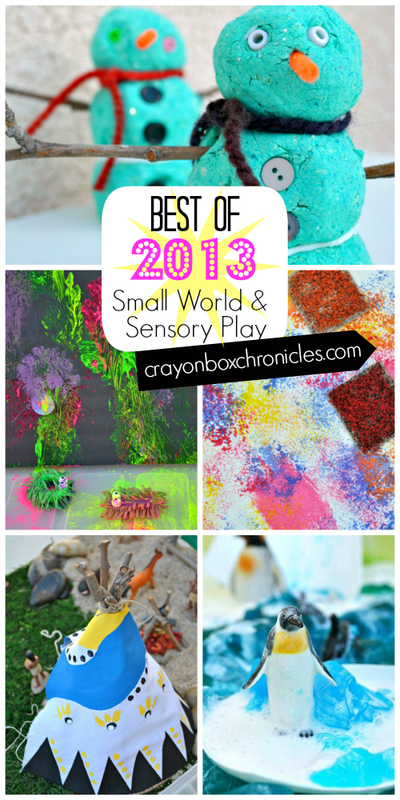 Here’s a full list of our small world play and our Best of 2013 Small World & Sensory Play. If you’d like to see more, please consider Subscribing by Email or RSS Feed for updates on all our fun activities! 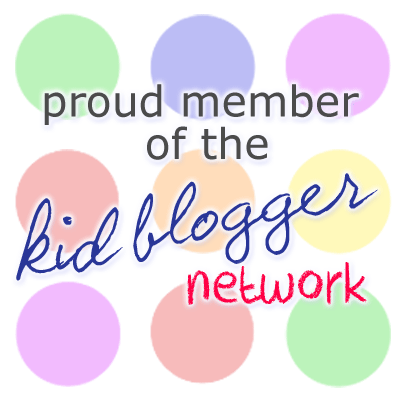 You can also connect with us on Facebook, Pinterest, Twitter, Goggle+, and Bloglovin’. Pingback: 10 Moon Sand Recipe Ideas + Ways to Play! - Look! We're Learning! Love the idea! Another teacher sent me this, knowing I was designing a unit on the desert for our large, multi-age, inclusive preschool class. I was also looking for a recipe for a sandy playdough. This sounds perfect. Thank you! I will be using this. However, you have some desert facts badly mixed up. I debated commenting, but if I had put all this work into this page, I would want to be corrected. You mentioned the Sahara desert in the first paragraph, and I think the facts listed there are probably correct. But I kept waiting for you to explain that some of the animals from the Safari Toob are not from there, but from the Sonoran desert–found in Arizona, USA and Senora, Mexico. (The bobcat, horned lizard, and the roadrunner, for starters). 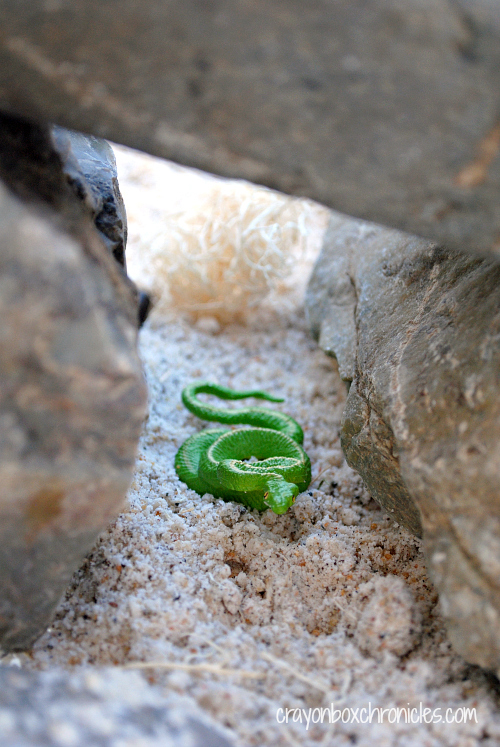 Also, that bright green snake shown can’t possibly be a rattle snake. I also think the cacti are great approximations of prickly pear cacti and will be checking a nearby Dollar Tree for moss balls. 🙂 But AFRICAN PEYOTE?????? Peyote is a rather small cactus (2-7 cm or .79 – 2.76 inches high) found in the AMERICAN Southwest (Chihuahuan desert). It looks nothing like what you depicted. Please check wikipedia–I did, just to make sure that I wasn’t crazy! Rant over. Any ideas on how to cheaply make saguaros, ocotillos, or yuccas? Pingback: Snow day! 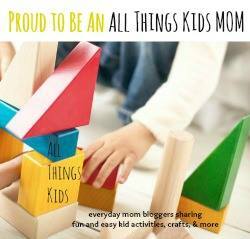 10 Small World Bins for Indoor Play - A simply good life. I found your post on Share it Saturday. This looks great! 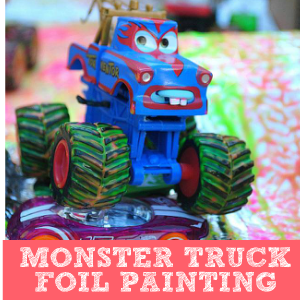 Your kids must have had so much fun with this! I know my kids would have! 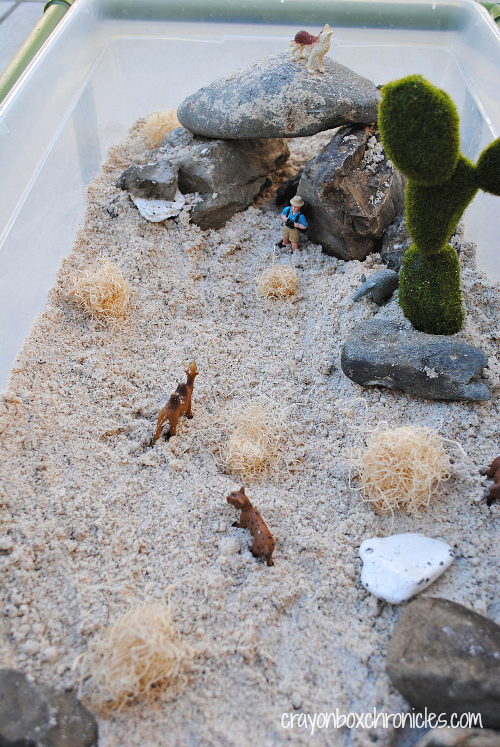 We made a desert terrarium that we used for small world play last year, but with the real cacti in it, we mostly just set the animals in it and looked at it 🙂 I’ll have to remember this one for if we learn about the desert again! Thanks for sharing! Yay! Thank you! So glad you like it. It’s a lot of fun and not that messy at all. The sand takes the “powderiness” (mess too) out of it! Enjoy your weekend. This is really neat!! 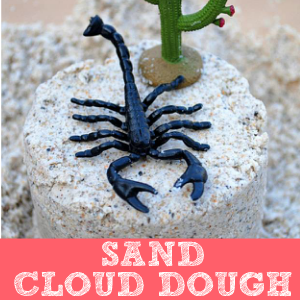 I’ve never seen cloud dough with sand!! I will have to try it out. Thanks for sharing at the Toddler and Preschool Pinning Party! Thank you Angela! It’s a ton of fun. Thanks for hosting too. Have a great weekend. Great cacti! and I love the moldable sand – we haven’t used that yet. 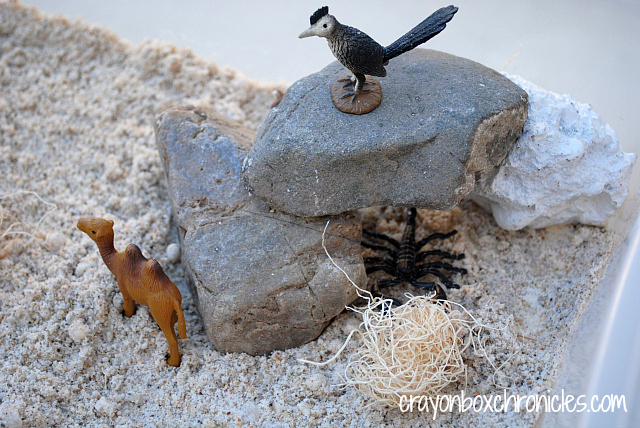 I’m featuring it in our ‘How Pretend Play leads to Science Exploration for Discover & Explore this week – thanks for linking up! 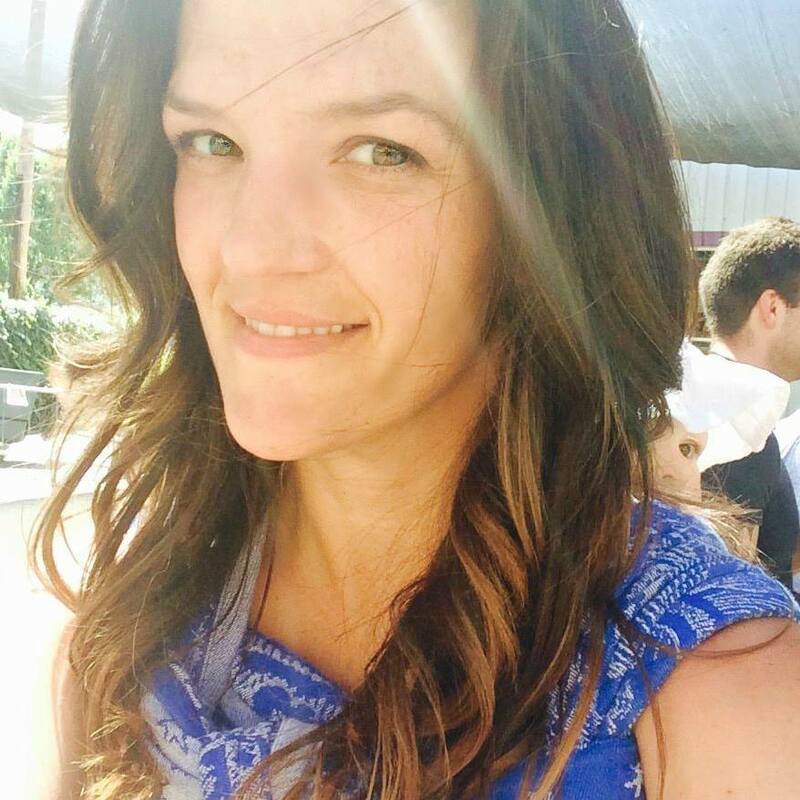 This is fantastic, Heather!! It totally jumped out at me when I was skimming my FB feed. We’re having fun with all things winter right now so a desert world would be a nice break from that. I think we’ll have to do a version of this soon! HI Ann. Thanks! I really appreciate your comments! Love your winter small world with the acorn house – so creative! What great ideas. 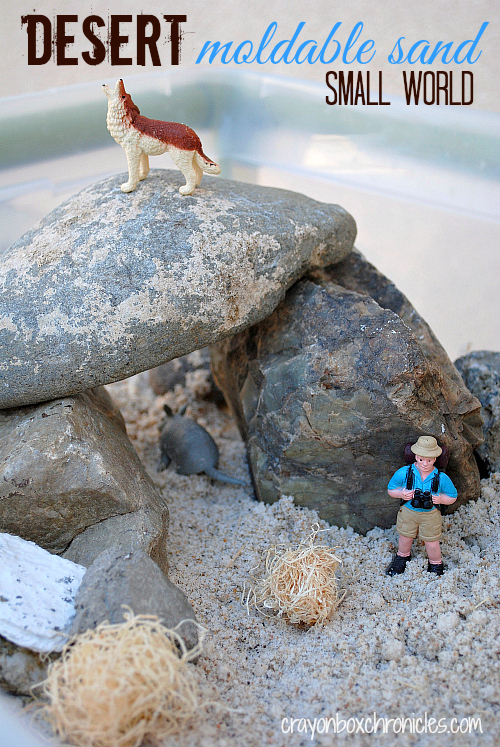 You have really inspired me, I think I need to make more small world play areas to get him more interested in playing with his little things – thank you. Awesome! That’s so nice to hear! Thank you for your lovely comments! I did do a dinosaur play – not as good as your ideas mind. Ow! I want to see! 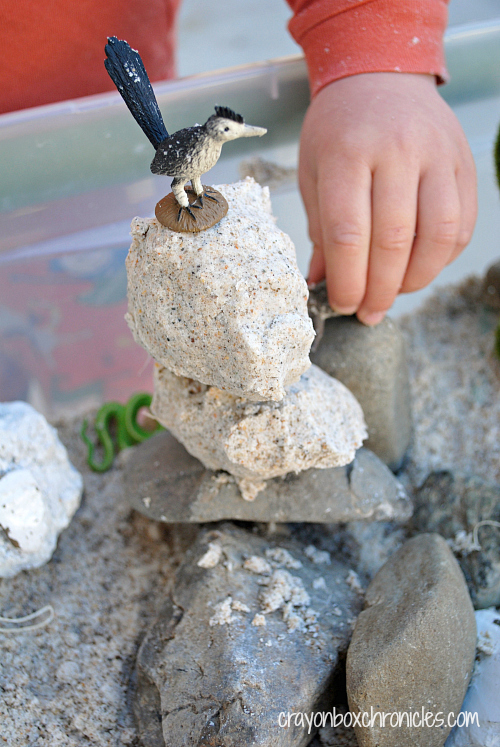 We love dino play! I bet it’s fantastic!